This vehicle actually saw trials. It used Williams-Janney hydraulic variable speed gear drive, and although it was intended to manufacture 75 vehicles, the difficulty of making the gear units proved prohibitive and only 3 vehicles were completed before cancellation of the order following the 1918 armistice. In any event, the transmission was superseded by the Wilson epicyclic gear as used in the Mk V.
Tank Mk VIII "The International"
The Mark VIII was the culmination of an international collaboration between Britain, France and the USA which started in 1917. Hence the name for the tank of "The International". The French withdrew from the project in 1918, and the first vehicles were delivered in 1919/20, too late for the War. 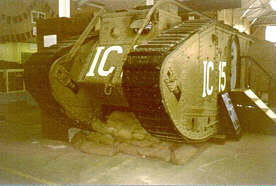 the American built vehicles were powered by a Liberty engine, giving the alternative name of "Liberty Tank" to the vehicle. The British built vehicles were powered by two 150hp 6 cylinder Ricardo engines arranged in a 12 cylinder V configuration. 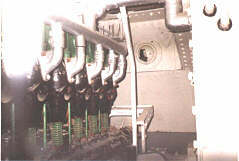 The engine was housed in its own compartment, a great advance on the previous marks. 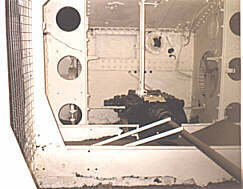 The most obvious difference between US and British vehicles was the presence of ball mounted Hotchkiss MGs in the superstructure sides of the British vehicles. 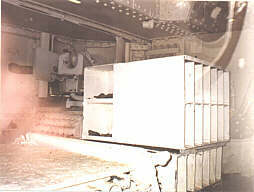 The US vehicles had Browning MGs mounted in the front and rear of the superstructure only. The Mark IX was a supply tank which could also be used as an APC. It could carry 500 cu ft of stores internally, or 30 men. There was additional storage space on the roof. 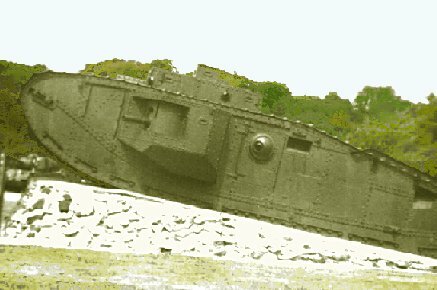 The first machines were delivered in October 1918, but they never saw action. There is a surviving vehicle at Bovington. The transmission unit and drive shaft are visible, but unfortunately the transmission is not complete and the cross shaft to the driving chain assemblies is not present. Note that sides of the Mark IX are cut back compared with the double skinned sides of earlier marks. This was to maximise storage space. 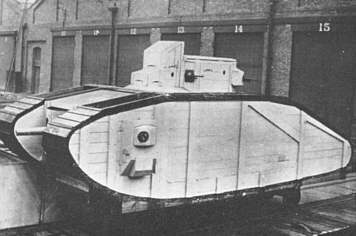 This vehicle was to be an improved Mk V, but never got beyond the design stage and was cancelled at the time of the 1918 Armistice. I have no details, and any further information would be most welcome.